Have you ever built a sand castle on an ocean beach? Was it washed away by rising water? This is an example of tides, the rise and fall of ocean water that occurs every 12.5 hours or so. The water rises for about six hours, then falls for about six hours, in a regular cycle. The force of gravity pulls the moon and Earth (including the water on Earth’s surface) toward each other. 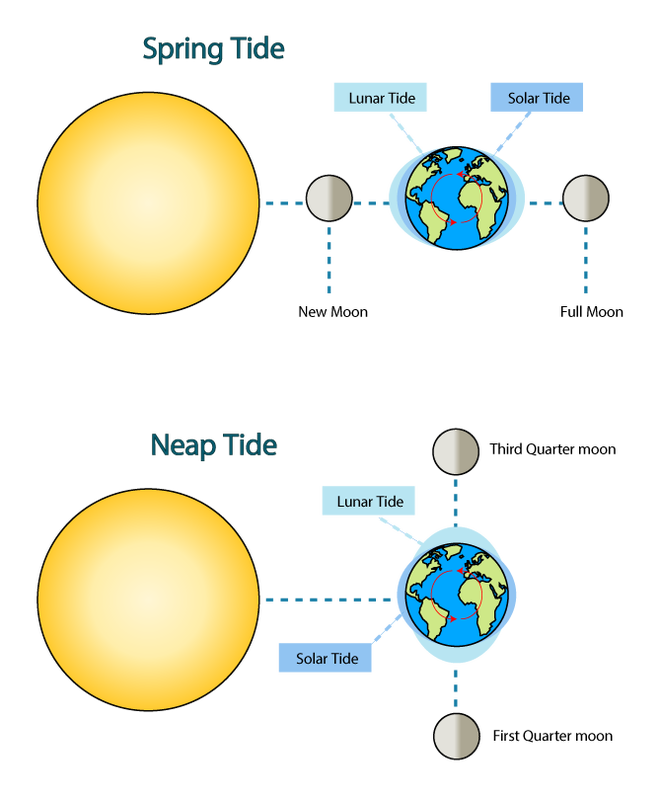 Tides are caused mainly by differences in how much the moon’s gravity pulls on different parts of Earth. The force of the moon’s gravity at point A, which is closer to the moon, is stronger than the force of the moon’s gravity on Earth as a whole. The water flows toward point A, and a high tide forms. The force of the moon’s gravity at point C, which is on the far side of Earth from the moon, is weaker than the force of the moon’s gravity on Earth as a whole. Earth is pulled toward the moon more strongly than the water at point C, so the water is “left behind.” Water flows toward point C, and a high tide occurs there too. Between points A and C, water flows away from points B and D, causing low tides. At any one time there are two places with high tides and two places with low tides on Earth. As Earth rotates, one high tide stays on the side of Earth facing the moon. The second high tide stays on the opposite side of Earth. 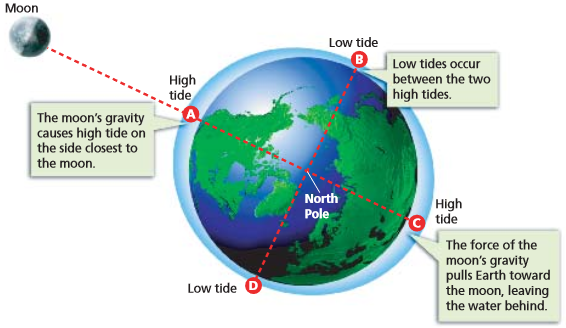 Each location on Earth sweeps through those two high tides and two low tides every 25 hours or so. The sun’s gravity also pulls on Earth’s waters. As shown in the top diagram of Figure 17 ----->, the sun, moon, and Earth are nearly in a line during a new moon. The gravity of the sun and the moon pull in the same direction. Their combined forces produce a tide with the greatest difference between consecutive low and high tides, called a spring tide. During the moon’s first-quarter and third-quarter phases, the line between Earth and the sun is at right angles to the line between Earth and the moon. The sun’s pull is at right angles to the moon’s pull. This arrangement produces a neap tide, a tide with the least difference between consecutive low and high tides. Neap tides occur twice a month.